Location: From the city of Prince George travel north on Hwy. #97 North for approximately 15 km. (9.3 mi.). Turn west (left) off Hwy. #97 North onto Chief Lake Road. Drive about 20 km. (12.4 mi.) to the lake via Chief Lake and Ness Lake Road. Resorts & Campsites: All services and facilities can be found in Prince George. 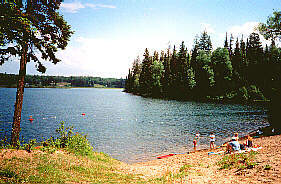 Resorts, campsites, and boat launching can be found at the lake. 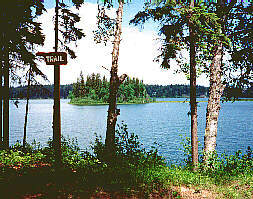 Swimming area, beach and miles of beautiful hiking trails can be found at the Ness Lake Regional Park just off the Ness Lake Road. Fishing Report: Rainbows up to 6+ lbs. are what most anglers are trying for in Ness Lake. Trolling with plugs, spoons and spinning gear are the most popular methods, however fly fishing also produces quite well. Eastern Brook trout are also present in the lake. Nukko & Hoodoo Lake - Nukko Lake is located just northeast of Ness Lake, and supports a Rainbow fishery. Hoodoo Lake lies northwest of Nukko and also contains Rainbow.